Your Hosts: Dr. Caroline Erdos, Speech Language Pathologist and Mary Jose Guerrier, Program Manager with Morneau Shepell. Myths about teaching a child more than one language are plenty. Often parents are discouraged from raising a bilingual or multilingual child because they’re told it can lead to confusion and speech delays, or that they’ve missed the window of opportunity. 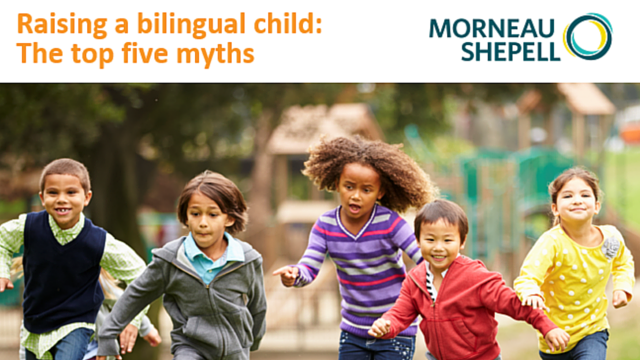 During this 30 minute webinar, Caroline Erdos, Speech-Language Pathologist, will discuss the most common myths behind raising a bilingual child. Participants will be able to ask questions and chat with Caroline as she discusses myths and shares tips to raising a child to be bilingual. About the presenter : Caroline Erdos is a Speech-Language Pathologist, working at Morneau Shepell’s Children’s Support Solutions and The Montreal Children’s Hospital. Caroline completed a Master’s of Science in Applied Speech-Language Pathology from McGill University. Caroline also received her Ph.D. in Experimental Psychology from McGill in 2011 with a thesis entitled “Predicting language and literacy outcomes of typically-developing and at-risk English-speaking elementary students in French Immersion programs”. Download our Bilingual/Multilingual handout here.